Rachel Von | The Journal Gazette Thomas Kirby with Brotherhood of Maintenance of Way Employees Division and Indiana Labor for our Revolution holds up a sign during an event with special speaker Rose Reagan for the National Medicare for All Week at the Allen County Public Library downtown branch on Sunday. National Medicare for All Week is sponsored by National Nurses United and Our Revolution and events are scheduled for this week all over the country. 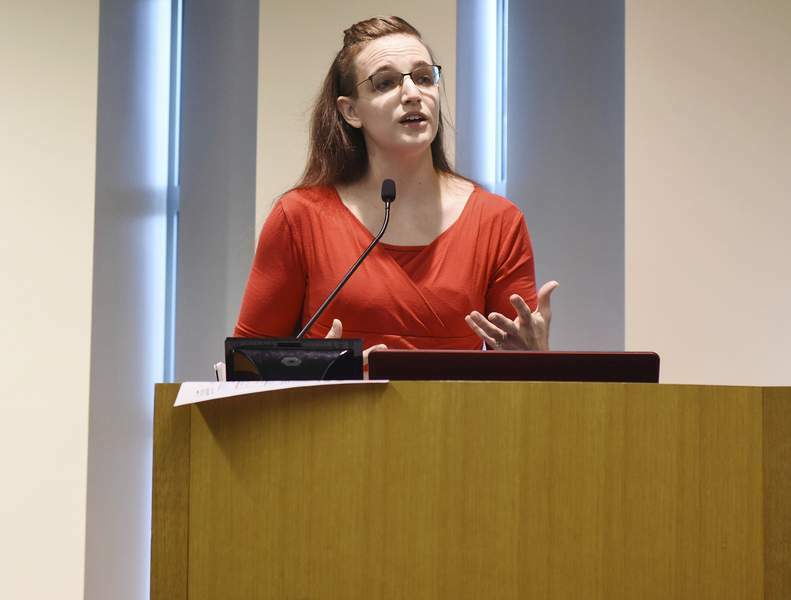 Rachel Von | The Journal Gazette Special speaker Rachel Rose Reagan speaks during a special event for the National Medicare for All Week at the Allen County Public Library downtown branch on Sunday. 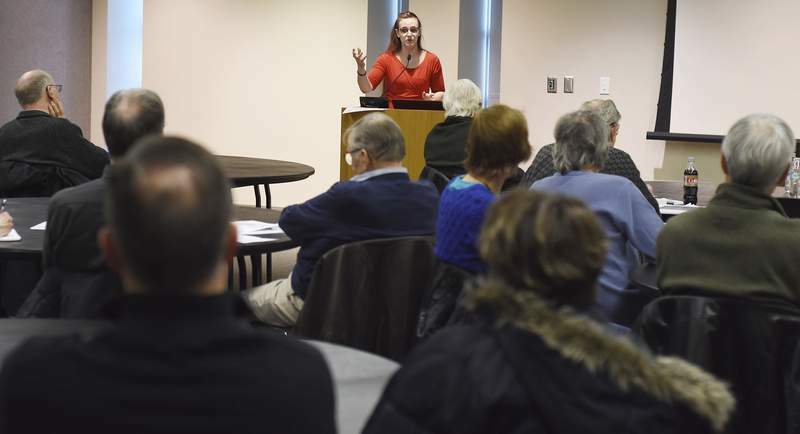 Rachel Rose Reagan didn't know if anybody in Fort Wayne would attend an event aimed to mobilize supporters of a government-run, single-payer health insurance system. She seemed awed Sunday as she addressed a crowded conference room at the downtown Allen County Public Library. "I can't believe we actually filled the room," Reagan said to the few dozen people sitting before her. 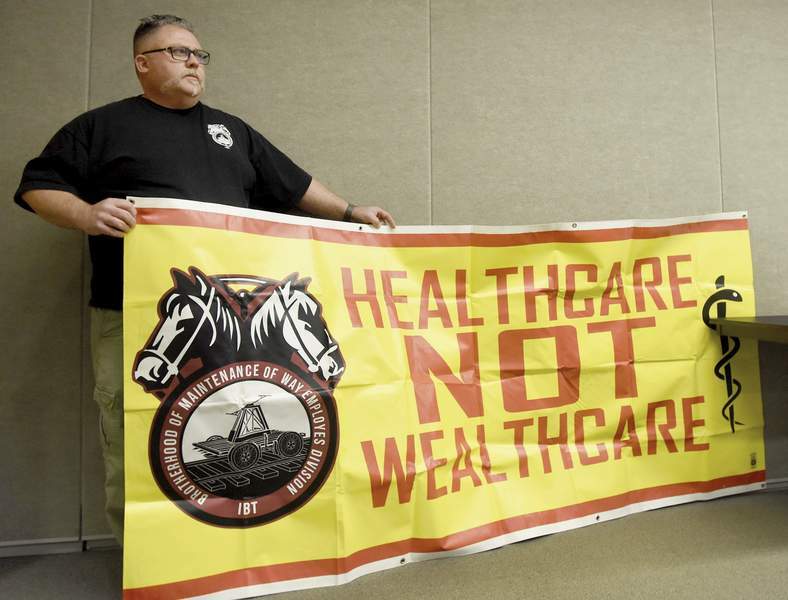 Such events are happening nationwide through Wednesday as part of the National Medicare for All Week of Action organized by National Nurses United. The Fort Wayne meeting was one of five planned in Indiana. Attendees were encouraged to canvass neighborhoods and crowds in an effort to spread public support for single-payer medical insurance. "These are your new teammates on this fight, right here," Reagan said. "…There is a job for everybody in this fight, and the goal is simple: We are trying to put overwhelming pressure on our elected officials so we can win Medicare for all." Proponents of a federal Medicare-for-all plan contend it would guarantee comprehensive medical coverage for the general population, reduce patient costs by eliminating insurance premiums, deductibles and co-payments and relieve employers from having to provide insurance to their workers. Opponents argue it would increase taxes and government spending, extend patient wait times and depress private-sector competition. Medical costs prompted attendee Colleen Pion to take action. Even with insurance, Pion said, she once accrued about $9,000 in medical debt and sought loans from family to help pay it. Now, she spends about $400 every three months for blood work, $80 a month on pharmaceuticals and $250 a month on supplements, she said. "It's something that no one should have to go through, especially if you have what they call good insurance in the United States," Pion said. "I'm not even someone who isn't insured. I'm someone who has a great group insurance package … and I still can't afford it." Elaine Fazzaro, a retired registered nurse involved with Hoosiers for a Commonsense Health Plan, described her family's battles with insurance companies. "The problem is, we don't need insurance companies," Fazzaro said. "We need health care." Advocates for change need to get legislators to listen, she added. "They're going to have to hear massive unrest from the masses, and that starts with us," Fazzaro said. "We're all going to have to get out there and raise hell, sharpen your pitchforks, light your torches and onward." Visit www.medicare4all.org for more information about the effort. Reagan expects details about local events will be added to the site. "Every interaction makes a difference," she said.